Looking for a fun and easy Easter dessert? 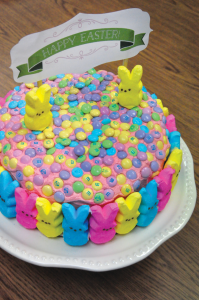 Look no further than this adorable Easter-themed cake. Featured in the “CW Interest” column in the March/April 2015 issue of Christian Woman, it makes for a cute centerpiece and a delicious show-stopping dessert. The banner is available for download here. In every issue, Christian Woman features issues that are important to Christian women, as well as creative ideas that make your life easier. Click here to subscribe or call 1-800-251-8446.